No two poles of bamboo are alike, so every home, bridge and bathroom is exquisitely unique. 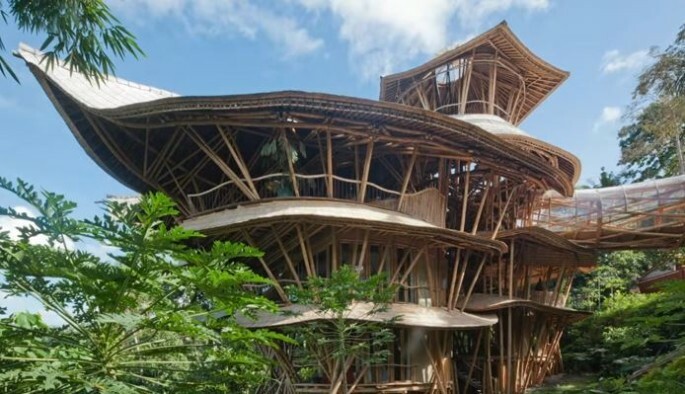 In this beautiful, immersive talk, she shares the potential of bamboo, as both a sustainable resource and a spark for the imagination. “We have had to invent our own rules,” she says. Ibuku is a team of designers and builders who aspire to make the most of bamboo and local talented craftspeople and young minds. We believe that bamboo’s potential is underestimated. It should be used to house many more people, especially in the tropics. We work hard to draw out beauty from this abundant wild grass. The traditional Balinese craftsmen work closely with our designers to develop a balance of ancient and new ideas. It also takes significant modern engineering to create original bamboo structures that meet our highest standards. Elora Hardy leads Ibuku’s vision and sustainable design. In 2010 Elora returned to her childhood home in Bali.